As the refugee crisis in Europe has come to dominate western media headlines, it has predictably given rise to a complex web of theories, analyses, and politically and ideologically charged omissions and distortions. The corporate propagandists of ‘acceptable journalism’ have presented the issue in a purely humanitarian and cultural light, with little to no political context in terms of the refugee influx as the fruit of imperial wars in Africa and Asia. These bastions of journalistic truth have managed to flush down the memory hole nearly all evidence published in their own pages of the overlapping strategies of regional and international powers that have conspired to wage war in Syria, openly colluded in wars of aggression in Libya, Iraq, Afghanistan, and Yemen, and prolonged and capitalized from seemingly endless conflicts in Somalia and elsewhere. All of these very conscious decisions by the ruling class and its political establishment in the US-NATO (plus Israel and GCC), have led directly to the “crisis” as it exists today. And yet, if they’re mentioned at all, it is merely in passing bemusement, the way one might refer to a stupid comment made after one too many tequila shots at a margarita happy hour. The refugee issue then becomes less a product of political conflict, and more a cultural battlefield with trenches dug along racial and ethnic lines: the struggle to maintain European ‘civilization’ against the barbaric hordes of uncivilized brown-skinned invaders arriving as a “swarm,” to borrow the unintentionally honest expression used by British Prime Minister David Cameron to describe the refugees. This is of course the neocolonial, supremacist position espoused most vocally by the far right throughout Europe, from Marine Le Pen and the Front National in France, to Hungary’s conservative Prime Minister Viktor Orban whose heavy-handed tactics – building fences, mobilizing troops and the unemployed, convicts, and fascists of various stripes – to block the refugee influx, have been both praised and condemned by various elements in Europe. While there is clearly an attempt to rewrite recent history to scrub the role of imperialism in fostering this crisis, there is also a deafening silence on the role of certain regional and international actors in manipulating it for political advantage. For instance, there is virtually no discussion in mainstream (and much of the alternative) media regarding the role of Turkey in redirecting refugees from its country to Greece and into Europe. There has yet to be even one substantive investigative piece in any establishment media on the collusion between the human traffickers of the Islamic State and other terror groups and criminal gangs, and their backers in the US, Europe, and Middle East. Equally, there has been virtually zero discussion of how the strategy of manipulated migration is part of a broader effort to further the goals of the Empire in the Global South. Indeed, such questions and debates are critical to understanding the political, economic, and socio-cultural implications of this issue. However, in asking such questions, one almost immediately encounters the virulent strains of racism, bigotry, and outright fascism whose pernicious influence has become pervasive in nominally anti-imperialist circles. Sometimes such ideology is manifested in centuries-old reactionary conspiracy theories in which cabals of Jews, Jesuits, freemasons, or reptilian overlords (as the case may be) conspire to destroy white Christendom. Other times it is simply a rehashing of the ‘barbarian invader’ trope, a product of both European history and good old fashioned Euro-supremacism. Why are these questions critical? Simply put, the discourse on the refugee crisis is essential to undermining the entire imperialist agenda in Africa and the Middle East. Leftists must be cautious not to take the bait on the liberal versus conservative culture war narrative rooted in a neocolonial worldview, while at the same time remaining vigilant about both the real geopolitical machinations driving the crisis, and the fascistic memes that pass for “telling the truth” in the quagmire of social media and online activism. There are two distinct ways in which the corporate media, in its role as propaganda appendage of the Empire, has deliberately confused the refugee issue. On the one hand, they have shielded the narrative from penetration by uncomfortable questions regarding the role of the West and its proxies in initiating, fomenting, and expanding the wars in Syria, Libya, Yemen, Afghanistan, and beyond. By doing so, the media removes the refugees from their politico-historical context, transforming them into so-called “migrants” – an elusive term designed to obscure the reality of who these people are, and why they’re desperately trying to get into Europe – as if they’re simply poor people looking for work, rather than victims of imperialism looking to protect their families and escape wars and destabilizations initiated by the West. On the other hand, the media has simply refused to critically examine exactly the relationship between the flow of refugees and the policies, both overt and covert, of the countries participating either directly or indirectly in these wars. There is virtually no investigation into the facilitation of refugee travel by the Turkish government despite the literally countless reports of the Islamic State, al-Qaeda groups, and myriad criminal organizations engaging in human trafficking in Syria and Libya specifically. a group of jihadis were first brought to the Turkish border town of Reyhanli on January 9, 2014 from Atme refugee camp in Syria in a clandestine operation. From there, they were smuggled into Tal Abyad, a border town used by ISIS as a gateway from Turkey, on two buses rented by the MIT [Turkish intelligence]…which it said were stopped by police a day after the operation following a tip-off that they were smuggling drugs into Syria. It was revealed that the buses had been used to smuggle jihadis after investigators found bullets, weapons and ammunition abandoned in the buses. The drivers of the buses, who were briefly arrested, said in their testimony they were told that they were carrying Syrian refugees and the vehicles were rented by the MIT. Two important points should be immediately apparent in reading the reports. First, and perhaps most obvious, is the direct relationship and contact between Turkish intelligence and terrorist fighters intent on waging war in Syria. Secondly, and most important to this examination, is the fact that, as the bus drivers’ testimony clearly indicates, they were told by Turkish authorities that they were carrying Syrian refugees. It seems then that Turkish intelligence openly facilitates the transit of refugees throughout Turkey, and has a direct chain of custody over their movements. Taken in tandem with the knowledge that Turkish intelligence is also working with ISIS and Nusra then, it is not at all far-fetched to assume that they are also colluding in the human trafficking networks. But while media has noted this important phenomenon, they have almost entirely buried the fact that those same ISIS (Islamic State) networks in Libya are being run by US-NATO asset Abdelhakim Belhadj, the man touted as a hero and great revolutionary by the imperialists in their war on Libya in 2011. 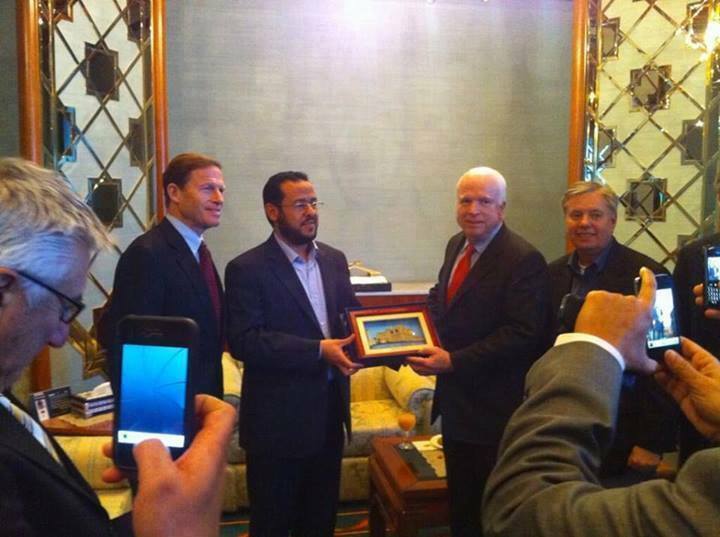 Indeed, Belhadj served the US cause in Libya so well that he can be seen receiving accolades from Sen. John McCain, never one to shy away from a photo op with a terrorist or fascist. Belhadj was initially rewarded after the fall of Gaddafi with the post of military commander of Tripoli, though he was forced to give way to a more politically palatable “transitional government” which has since evaporated leaving in its wake ISIS, run by the very same Belhadj. It must be said that the refugee issue is far bigger than just US-NATO wars in Libya and Syria. Indeed, the refugees have come from countries that have been directly impacted by other imperialist policies, such as the ongoing economic war against Eritrea. As WikiLeaks cables revealed, there has been a concerted effort by the US to promote and facilitate the migration of Eritrean youth to the West using the lure of “educational opportunities” funded by the US government. Many of these young Eritreans, duped as they are, are then sadly caught up in the same human trafficking networks, often becoming victims of kidnapping or worse. Similarly, many of the refugees come from Afghanistan and Iraq, two countries still being devastated by US wars of aggression. They come from Pakistan where terror groups have waged genocidal campaigns against Shia muslims of the Hazara ethnic group, among others. They come from Somalia, a country still embroiled in a seemingly endless state of chaos facilitated by US policy. In short, the refugees are unmistakably victims of US-NATO (plus Israel and GCC) imperial policies. And there is almost no mention of any of this. As soon as one begins to interrogate the issues by asking questions such as those above, immediately one is confronted by the most exasperatingly tiresome, hackneyed, and utterly discredited conspiracy theories which still worm their way into far too much online discourse. In fact, according to such internet buffoonery, nearly every political development and conflict in the world can be chalked up to some illusory master plan enacted generations ago by a secret cabal of [insert demonized group of choice], rather than the complex political, economic, and social factors that give rise to human phenomena; so, too, with the refugee issue. The conversation often can sound something like, “Have you noticed that the Muslims and Africans flooding into Europe are mostly young males? It’s not a coincidence that the Jewish globalist plan is to destroy national boundaries and pervert the white Christian world with a fifth column in the quest for total global control through the destruction of nations and consolidation of the rule of Jewish bankers. #WhiteGenocide.” One could be forgiven for thinking that that is satire and hyperbole for comedic effect; sadly, no. That is taken almost verbatim from multiple memes and various written pieces circulating in the morass of social media. Normally, one would be quick to dismiss such idiocy as simply the childish ramblings of fascist nitwits whose study of history is confined to the Alex Jones School for Racist Lunacy. However, it is important to note that such discourse has an increasingly strong presence in nominally anti-imperialist and leftist circles, where opposition to Israel’s genocidal policies, and the supremacist ideology of Zionism, provide cover for outright fascist tendencies to cloak themselves in the flag of anti-Zionism. When the unhinged blather of David Icke and Alex Jones becomes acceptable discourse, it is cause for any anti-imperialist to worry. For this reason, the refugee issue has caused many of us to worry. [Conspiracism has] penetrated deep into the American left…These days a dwindling number of leftists learn their political economy from Marx. Into the theoretical and strategic void has crept a diffuse, peripatetic conspiracist view of the world that tends to locate ruling class devilry not in the crises of capital accumulation, or the falling rate of profit, or inter-imperial competition, but in locale (the Bohemian Grove, Bilderberg, Ditchley, Davos) or supposedly “rogue” agencies, with the CIA still at the head of the list. Though speaking of 9-11, Cockburn could easily have broadened that critique to include the growing number of people on both left and right, who subscribe to the Rothschild-Illuminati-New World Order worldview (if it can be called that). His argument, entirely correct in my view, is that in place of real historical-materialist analysis, or substantive analysis of any kind, be it anti-capitalist or the like, a sort of quasi-mystical belief in irrational and unseen forces has taken root in the collective imagination of many so-called activists. Cockburn quoted philosopher and CounterPunch contributor Michael Neumann who succinctly noted that such thinking “probably comes from the decline of Western power. Deep down, almost everyone, across the political spectrum, is locked in a bigotry which can only attribute that decline to some irrational or supernatural power. The result is the ascendency of magic over common sense, let alone reason.” Indeed, it is bigotry, or perhaps more correctly a reactionary racist and fascistic worldview, that owes much to tsarist and Nazi propaganda, and the right wing extremist scribes who preserved it in the post-war period. Such thinking is, sadly, not only alive, but thriving, in allegedly anti-imperialist circles. No doubt these memes have been wet-nursed by Zionism and Israeli policies which, in point of fact, are fascist and in many ways indistinguishable from the Nazism they allegedly abhor, as this author has argued numerous times. In effect, Zionism has contributed in no small part to the proliferation and normalization of fascist sentiment on both left and right. And it is precisely this sort of thinking that is now coloring the debate on refugees. Suddenly, the refugee crisis becomes a conspiracy to destroy ‘White Europe,’ rather than an outgrowth of imperialist wars undertaken by the US-NATO powers. 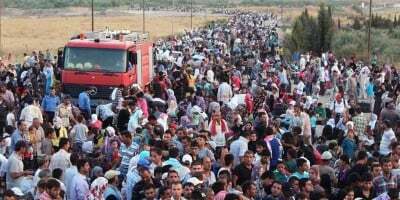 Suddenly, the refugees become invaders, while the aggressors become the victims. This inversion is at once insidious and incredibly disheartening for those activists and analysts (this author included) who dedicate much of their time and effort to exposing the machinations of the Empire and its hegemonic agenda. To again quote Cockburn, “There are plenty of real conspiracies…Why make up fake ones?” Exactly! The conspiracy of regional and international actors needs to be unraveled, the evidence made public, the guilty prosecuted for war crimes. The conspiracy of silence in the corporate media needs to be exposed for what it is: still more evidence of how the propaganda matrix actually operates, how it serves the Empire. These are the conspiracies that matter. Let’s leave the Rothschilds, Illuminati, and lizard people to the darker recesses of internet irrelevance. While the racists cry from the mountaintops that their precious White Europe is under siege, let us recognize that the discourse of anti-imperialism is also under siege; that the anti-imperialist, anti-capitalist, anti-fascist space must be reclaimed and must be defended, whatever the cost.